Manuel Moreno-Buendía was born in Murcia, Spain on March 25, 1932. His family moved to Madrid in 1942 where he studied at the Conservatory of Madrid and had as a composition teacher for operas and zarzuelero Conrado del Campo . In 1957 he joined the non-denominational Grupo Nueva Música (New Music Group), whose aim would be to update Spanish classical music. In it were composers such as Luis de Pablo, Antón García Abril and Cristóbal Halffter and as songwriters Manuel Carra and Alberto Blancafort. Between 1970 and 1981 he served as musical director of the Teatro de la Zarzuelaas. Since 1980 he has been the Professor of Harmony at the Superior Conservatory of Music of Madrid. 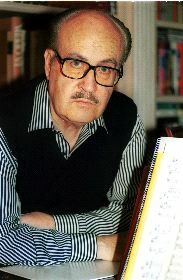 Manuel Moreno-Buendía wanted to update the zarzuela. Although already in the 1960s he composed pieces like Carolina when the zarzuela genre was already beginning to languish, it would be in the following decade when he made a series of renewed zarzuelas (they contained elements of the musical, dance, the singers had only a lyrical role), with La isla of Impossible Dreams (1971), The Wanderers (1977) based on a text by Máximo Gorki , and Fuenteovejuna (1981) based on the homonymous work of Lope de Vega . He composed different music for various scenes, highlighting the ballet Eterna Castilla for Antonio El Bailarín, which premiered in 1964 at the Teatro de la Scala in Milan. He also composed incidental music for various works: Ligazón (1969) or Antonio and Cleopatra . In the symphonic field, the concertanta suite for harp and orchestra he composed in 1958 stands out and he provided the National Music Prize, the infantile songs for voice and piano (1956) and the Concierto del buen amor for guitar and orchestra (1992), inspired by the work of the Archpriest of Hita. He composed on four film scores, all in the 1960s, among which was one Euro-western “The Secret of Captain O’Hara”. Manuel retired in 2000 after more than 40 years of teaching. BUENDIA, Manuela Moreno (Manuel Moreno-Buendía) [3/25/1932, Murcia, Spain - ] – composer, member of the musical group Grupo Nueva Música.